Welcome to the first quarterly Alaska Men Choose Respect Newsletter! This newsletter will keep you updated about the many AMCR related events, volunteer opportunities, and mini-grant opportunities happening across Alaska. More specifically, this newsletter hopes to help men become a part of the statewide movement of men promoting respect. If you have any male engagement related events, trainings, or volunteer opportunities that you’d like to see featured in the newsletter please send them to amcr@andvsa.org with the subject heading “Newsletter”. If you have or are currently working on an Alaska Men Choose Respect related project in your community we’d love to write about it as well. Please email us using the subject heading “AMCR Community Spotlight”. This quarter we’re gearing up for another COMPASS Statewide Training! The training, which will take place on December 2nd-4th will guide participants through accessing their own stories and using those stories to help guide young men in their lives and relationships. In addition, participants will gain skills and ideas on how to implement COMPASS through hands on practice using COMPASS. 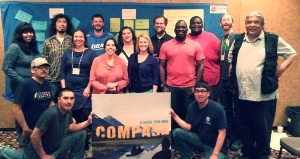 COMPASS: A Guide for Men made its statewide debut this spring as ANDVSA in collaboration with statewide and community partners, hosted a community based training in Ketchikan in April and a statewide training in Anchorage in May. COMPASS is a toolkit created through the collaboration of community members from across Alaska that assists men in communities working with young men to help build healthy identities and relationship skills through discussions, activities, and stories around 7 key topics. Engaging Men Leadership Team: Haven House is currently seeking volunteers to help recruit members and maintain a group of men in Homer to be a part of the local movement to end violence. Girls on The Run 5K: Haven House needs help planning and organizing this event. Please see the contact information listed below if you'd like to help out. PhotoVoice Class (Homer Middle School): PhotoVoice is a project where participants take photos meant ro represent how they see their community. This PhotoVoice class will cover the topics of underage drinking and masculinity. Mentor Spotlight: If you're a man who currently mentors youth, Haven House would like to highlight what you're doing. If you are interested in any of these opportunities please contact Rachel Romberg at Rachel@havenhousealasa.org or give her a call at (907) 235-7712. To help plan or volunteer at these events please Richard Radford at richardr@aware.org or call 586-6623. 2014 is the year that we saw the piloting of COMPASS: A Guide for Men in communities across Alaska! A great group of guys from the Ketchikan Regional Youth Facility (KRYF) were the first group to use the entire toolkit with their group. KRYF staff shared that the toolkit, “lifted the mood of the entire facility”. KRYF, a Restorative Justice Program, builds skills in youth to prepare them for successful integration back into their communities. The facility’s employees had some great things to say about the program, “We really saw kids hold on to and embrace their cultural heritage more than they had before”. Another mentor shared, “We got some of the best talks that we’ve ever had with these kids”. We’re really excited to see COMPASS being used by mentors and even more excited that it’s working well for them. Copyright © 2014 Alaska Network on Domestic Violence and Sexual Assault, All rights reserved.